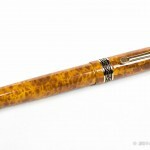 The pen for this review was provided free of charge by the good folks at Goulet Pens in exchange for an honest review. No additional compensation was provided. All opinions expressed herein are my own. I liked the Vac 700. The filling system was fun, and I enjoyed watching the ink slosh around in my first demonstrator I also appreciated the ability to swap out nib units, allowing me to easily and cheaply experiment with different nib sizes. But, as my collecting went along I found myself using my Vac 700 less and less until it had largely been relegated to one of the pens I use for ink reviews. 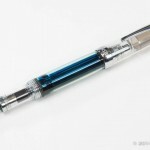 TWSBI’s Vac 700 has been one of the most economical way to gain experience with a vac-filled pen for many years. 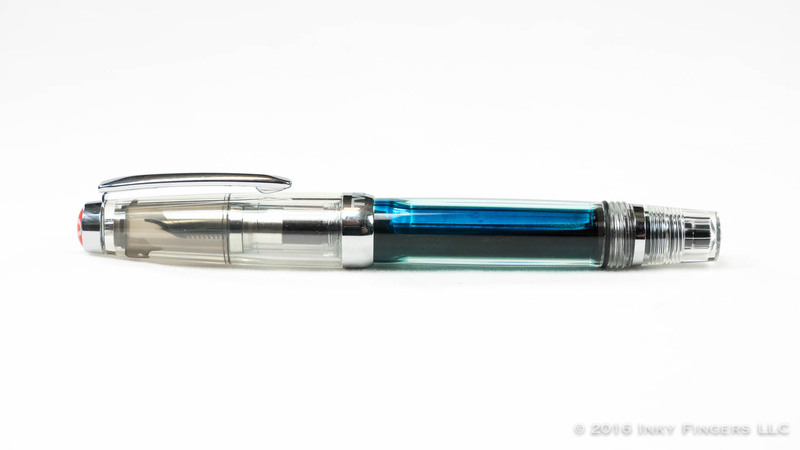 And, like most of TWSBI’s offerings, they were well-built, well-performing pens. 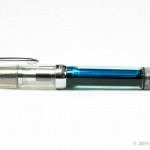 Recently, though, TWSBI has been introducing smaller pens into their lineup. 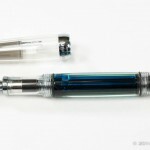 First, they introduced the TWSBI mini, a pocket-sized piston filler. 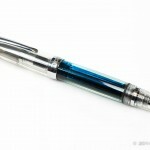 And for the last couple of years, TWSBI has been teasing the release of the Vac Mini. Now it’s here. 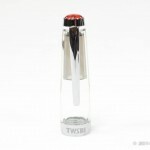 The cap features the recognizable red TWSBI logo medallion on the top. The clip is springy but solid, and has a nice streamlined profile. 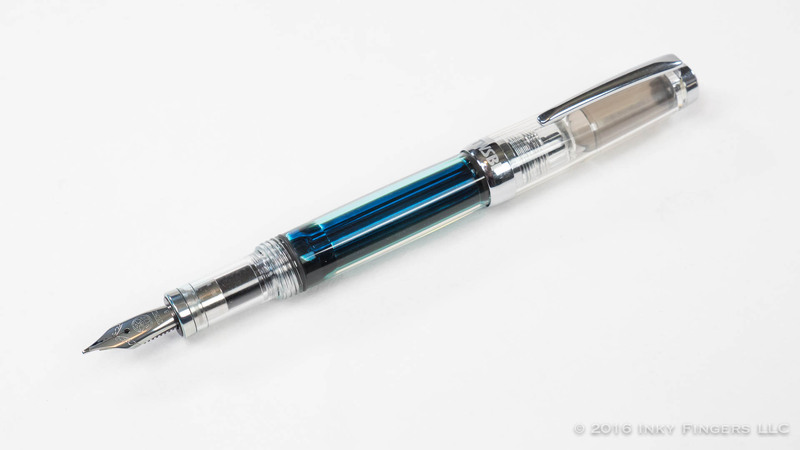 In a rather confusing design decision, TWSBI has opted to make the cap’s inner liner out of a cloudy grey plastic, which looks a bit out of place in the otherwise all-clear design. 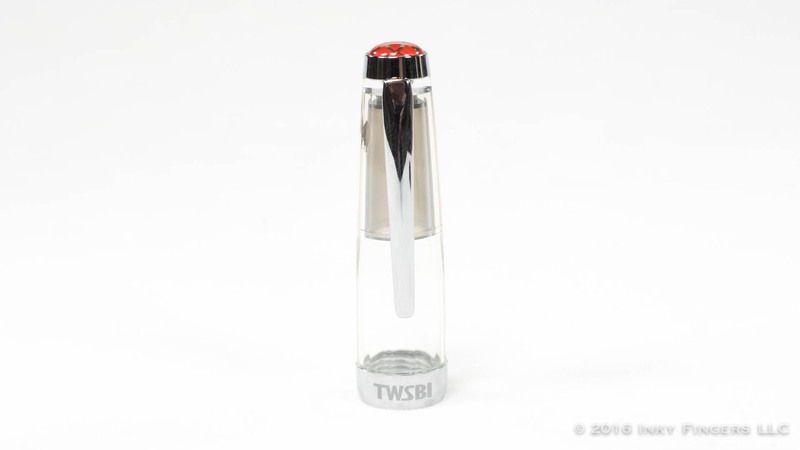 The cap ends in a chunky metal cap band on which “TWSBI” and “Vac Mini Taiwan” are etched. 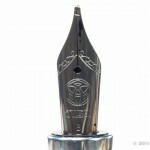 The pen’s barrel is short, as befits its “Mini” moniker. Toward the end of the barrel is a set of threads for holding the cap on when posted. 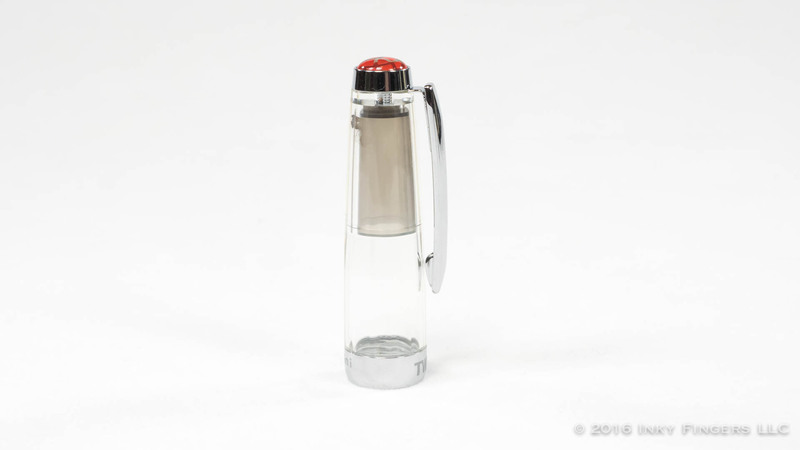 The pen’s vac filling system is controlled by way of a clear plastic knob at the end of the barrel. 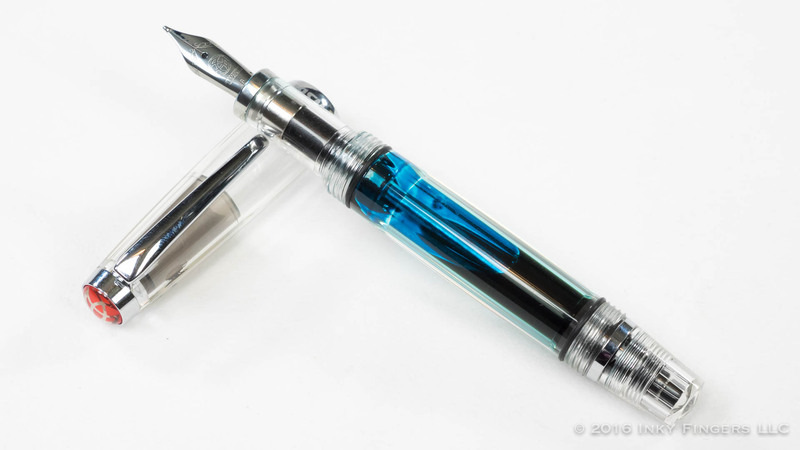 If you aren’t familiar with the vac-filling system, the TWSBI Mini fills by unscrewing the knob at the end of the pen, pulling the plunger piston out all the way, inserting the nib unit into the ink, and depressing the plunger back down. 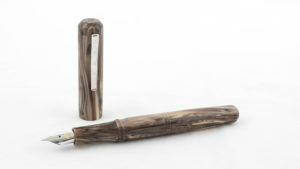 The rubber gaskets inside the pen create a vacuum behind them as air is expelled on the downstroke. When the stopper reaches a widening point inside the barrel, the seal is broken and the vacuum that has built up behind the plunger gasket pulls ink into the barrel. 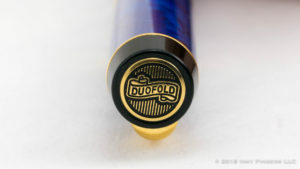 The vac filling system is fun to use, and it has the benefit of filling a pen quickly and allowing for a substantial amount of ink uptake on a single stroke. But it can be a bit of a pain to clean, and comes with what I consider a particularly significant flaw. 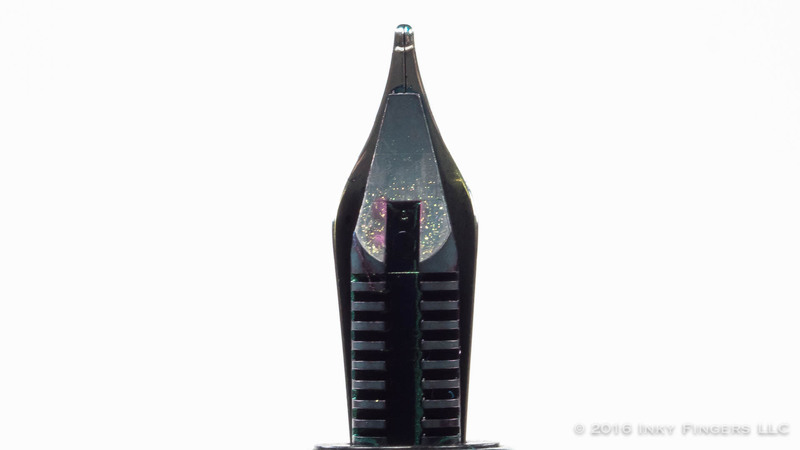 The end of the plunger has a small cone-shaped rubber stopper which, when the plunger knob is tightened down, stops the flow of ink to the feed and nib. Manufacturers try to pass this off as a feature (it’ll keep your pen from leaking when you fly!!!) but mostly, it’s just a nuisance. 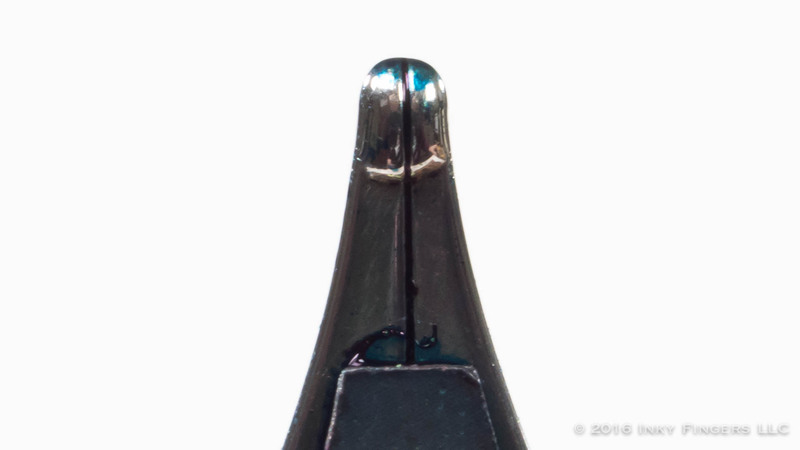 If you forget to open the plunger knob a bit when writing, you will end up writing the nib dry fairly quickly. 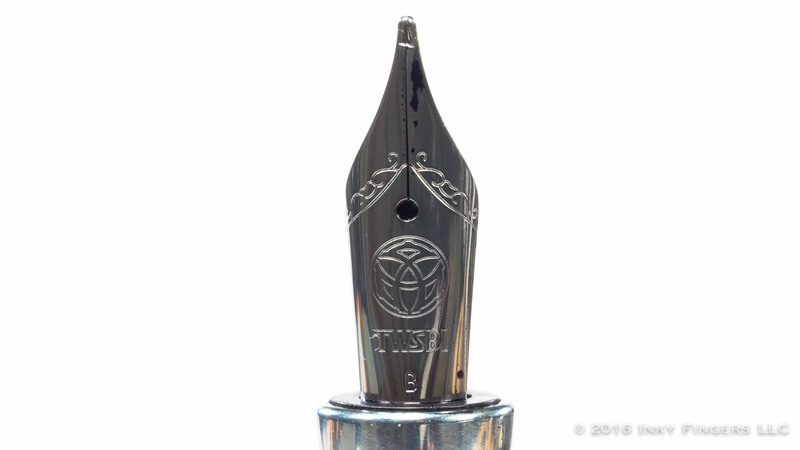 This design was present on the Vac 700, (and also on the Pilot Custom Heritage 823), so it didn’t come as a surprise, but as that is one of the most complained-about “features” of the Vac 700, I was hoping TWSBI would reconsider implementing the same design on the Vac Mini. It is possible to remove that little cone-shaped gasket and prevent the stoppage from happening, which is what I did on my Vac 700. With the Vac Mini, I found that constantly opening and closing the knob was a nuisance, so I usually just ended up leaving the knob slightly unscrewed pretty much all the time without any ill effect. 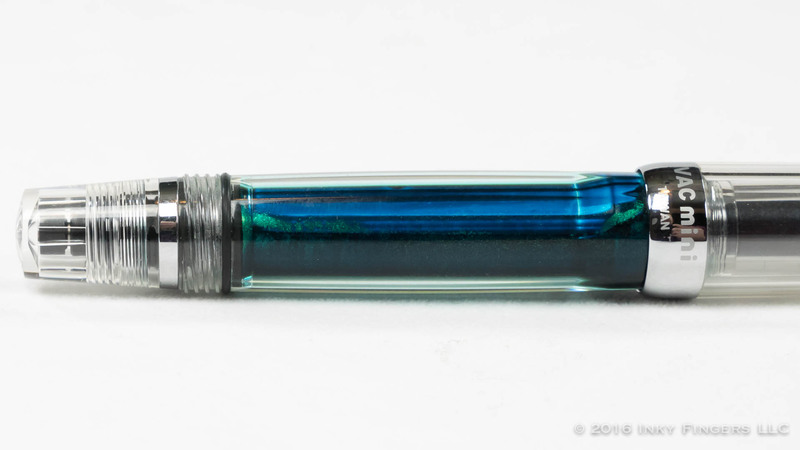 The pen’s cap comes off with 1.5 rotations, leaving a very short pen. It is, in fact, too short for me to use unposted. It is in posting the pen that the Vac Mini has what I consider another design flaw: the only way to post the cap is the screw it onto the threads at the back of the barrel. The threads are dual-start threads, meaning there are two possible entry points for the threads to mesh. 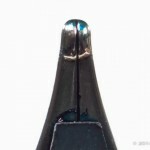 If you don’t start them at exactly the right spot, you’ll end up with the cap’s clip 180° to the face of nib, leaving the clip to rest right in the web of your hand, which I found uncomfortable. 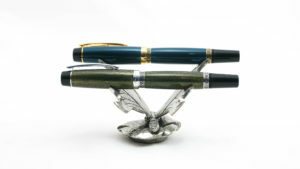 Once the pen is posted, the balance is superb, and the pen is quite comfortable in the hand. But having to screw the cap onto the barrel to post means that this is a pen that isn’t well-suited to writing environments where you are writing in short bursts, like taking meeting notes (which, coincidentally, is how I use my pens about 75% of the time.) Constantly having to cap, uncap, post, un-post, and get the threads to mesh up properly means that I ended up missing about half the notes I was trying to write down. If you’re the kind of person who writes in long writing sessions, or this pen is comfortable enough in your hand that you can use it unposed, I can’t recommend it highly enough based on the way it writes. If you are using your pens more like I do, this may not be the right choice for you. 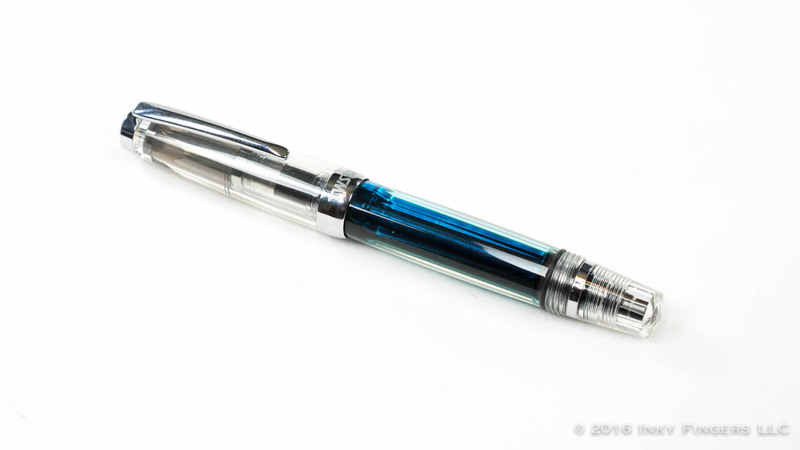 The pen’s section is perfectly cylindrical and is made of the same transparent plastic as the rest of the pen. This allows you to see both the feed and the ink flow in the section, which I think is pretty cool. The only thing that would have made it a bit cooler would have been a clear plastic feed. The section is a touch on the narrow side, and there is a decent step-up between the section and the barrel. But even when I held the pen on the threads, they never bothered me. They were quite smooth and not sharp. 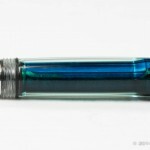 TWSBI pens have always been known for good nibs. When you hear complaints about the pen, those complaints rarely center around the way the pen writes. 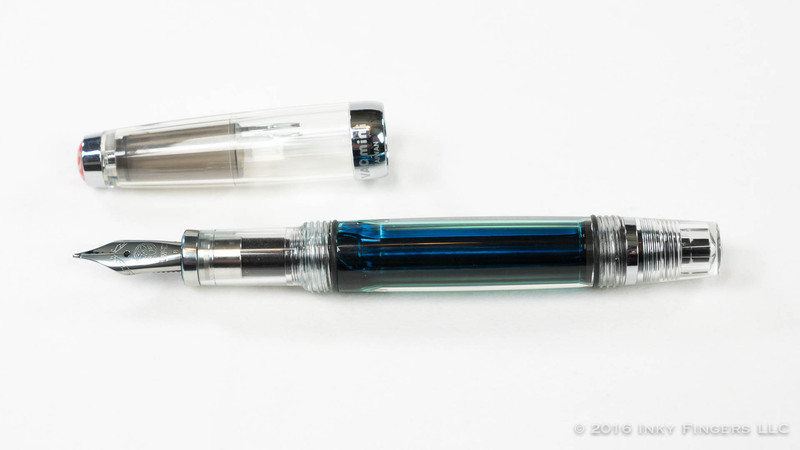 The Vac Mini uses a #5(ish)-sized Jowo nib unit—the same nib that TWSBI uses on the Eco, Classic, and Diamond Mini. I normally opt for a medium, but wanting to try out something different, I decided I was going after a broad. I’ve always liked TWSBI’s nib, they seem to have really upped their game lately. The broad nib on the Vac Mini was super-smooth and nice and juicy; it was a lot of fun to write with. 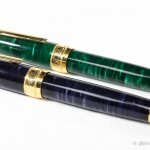 I initially inked up the pen with the well-known Emerald of Chivor. Aside from the fun of seeing the gold particulate float around in a demonstrator, the nib was juicy enough that it really allowed the ink to shine. The broad nib on this Mini is pretty much perfect and is my favorite of the 8 different TWSBI nibs I’ve used. I purposely don’t watch/read a lot of other reviewers’ takes on pens, especially popular ones. I like to form my own opinion without it being colored by other users’ experiences. That being said, I did hear through a few sources that a couple of had issues with the ink flow on the Vac Mini: It would write itself dry or choke up. I never experienced that issue with my Vac Mini. If I didn’t unscrew the plunger before I started writing, or I left the pen uncapped for a few minutes without writing, it would dry up. So long as the plunger knob was unscrewed, I never had any issues with ink flow at all. Even with particulate inks like Emerald of Chivor. 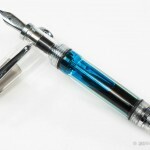 At $60, the TWSBI Vac Mini is a rather interesting value proposition. It is a well-built pen that writes superbly, but the quirks of the vac filling system and the need to screw the cap on for posting impact the usability of the pen for me in many situations. 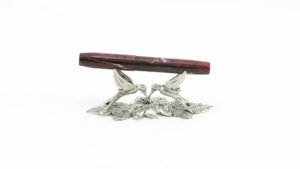 I can whole-heartedly recommend the pen so long as it will work for your style of writing. 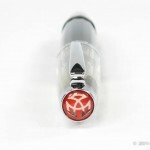 However, compared to some of TWSBI’s other offerings I find the Vac Mini offers a bit less value for its price. The Diamond 580 is $10 cheaper. 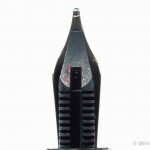 The full-size Vac 700 is only $5 more expensive, gives you a larger ink capacity, comes with larger (and interchangeable!) #6 nibs, and is long enough that I don’t have to post the pen to write with it. And the Eco is half the price of the Vac Mini. So, yes. It’s a good pen. A very good pen. 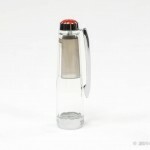 If you want a vac filler and you have smaller hands, it’s an excellent choice. Otherwise, perhaps some of TWSBI’s other offerings may suit your need a bit better.